This creative display was discovered while on a garden tour and shared by our NY sister. One of the questions we frequently hear in the tea room is 'what's the difference between High Tea and Afternoon Tea?'. And the other question we frequently get asked, 'Do you serve High Tea?'. Low tea is Afternoon Tea, whereas High Tea is actually the workingman's supper. Afternoon Tea will have all the delicate little tea sandwiches, scones, and sweet little desserts and is served late afternoon, 4:00 pm. High Tea is served much later, and would include heartier food such as meat pies, beef stews, and such. The farmer would come in from the field and ask his wife, 'what's for tea? ', and he would be asking about supper. Tea of course would also be served. One other distinction, as this photo demonstrates, high tea was typically served at a high table and low tea, afternoon tea, was served at a low table. The Dorchester Hotel in London serves their Afternoon Tea around low tables in the lobby. Over the years, as Afternoon Tea became more popular and slightly Americanized, and hotels wanted to feature tea as an option, they adopted the name 'High Tea' in order to sound more elegant and upscale, thus adding to the confusion in the States as to the difference between the two. At Sweet Remembrances, we serve Afternoon Tea. One year, we featured a High Tea as a special event, and served High Tea as the supper meal. Our guests were all disappointed that it was not Afternoon Tea and that there were no tea sandwiches, scones, or little desserts. That was a learning curve for all of us! Our summer adventure took us out to experience several National Parks. Of course you realize that there aren't any tea rooms in these parks. I know! So, we (I) made our own tea party fun when we (I) discovered five matching white oversize teacups in a thrift shop in Moab, Utah. Since there were five of us traveling together, it was the perfect solution to this lack of tea room visits. Yellowstone was fun since the steaming hot springs provided the perfect photo op for the pristine white teacup! And moving on to the Grand Teton National Park, also in Wyoming, we stopped to lift our cups up to the breathtaking beauty of these mountains and the surrounding environs. Simply amazing! We recently hosted a special children's event where mothers, grandmothers, and young ladies dressed in their princess finery gathered for an Afternoon Tea that included a three tiered tray laden with kid friendly and adult friendly tea party food. Fresh fruit with Almond Cream, assorted tea sandwiches including egg salad mini tarts, pineapple chicken salad sandwiches, cucumber sandwiches and peanut butter and jelly tea pot sandwiches (a favorite). Chocolate chip scones with sweet cream and Peanut Butter Blossoms rounded out the party cuisine. The real party started once Belle and Moana arrived! Going from table to table, the princesses greeted each guest and chatted with the young attendees. Smiles were abundant, and many photos were snapped. Eventually the party moved to the open garden area behind Sweet Remembrances where games, dancing, and singing took place. A special thank you to My Fantasy Party for working with us to make this a memorable afternoon. Saturday was chilly, rainy, sunny - the weather never matters and it doesn't stop anyone who comes to have fun. 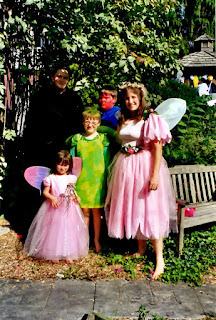 There were plenty of little fairies, sprites, and knights frolicking through the garden trying to find the wee folk dancing between the raindrops. Nothing seemed to slow anyone down and I was able to say good-bye to plenty of families who were completely enthralled by their somewhat damp experience. The next day everyone was more than happy to see the sun again. Many children who came the day before stopped by and must have told what seemed to be all of their friends. It was wonderful to hear the chaotic symphony of giggles, singing, and jingles. The children were not the only ones to have a great time, though. It was wonderful to see parents run with (and sometimes after) their children as well as dance and sing. Plenty of adults were more than happy to dress up and paint their faces with everyone. While I’m sure many parents are willing to be silly with their children everyday, for children it is always wonderful to see mothers and fathers become kids again, unafraid to play. I was one of the luckiest workers at the festival. During the first day I was able to stay toasty warm and dry inside. My job was to help those through the store before they left and to hand out plenty of unique fairy names to all who could tell me how many fairy folk they saw. The second day I was lucky enough to be at the craft table where we made bottle cap magnets, paper mache covered bottles, and other fun crafts. This was where the fairy festival really came to life. I was able to watch the little ones’ creativity fly and the adults learn another way to see the world through their child’s eye. Many kids created absolutely stunning color combinations that surprised their parents and me. As the day moved on I became more amazed – and thrilled – by parents’ reactions to their children’s artwork. While the weekend is centered on the children it is a perfect way to help the parents and caregivers see the world like a kid again. Simple, beautiful, colorful, and of course, magical. These pictures and memories will definitely give me warm and fuzzy memories something to look forward to next fall. Thanks to Fotos by Fudd for these great photos of our event. We look forward to seeing you Saturday, September 9th and Sunday, September 10th! Open from 10 am to 4 pm, admission is $5.00 person. Children under 3 are free. Please note: please park strollers on the side porch before entering the festival gardens. Thank you! Visit our website for the Schedule of Events for each day. Vacation Time is Tea Time! And having recently enjoyed a summer vacation, we of course enjoyed tea time. Our adventures took us out West this year to enjoy the amazing beauty of our country at several National Parks. But first, tea time! We began our adventure with a stop at the GGS Hat & Gloves Tea Room in Mohnton, PA, just a short hop off the PA turnpike near Reading to enjoy the Queen's Tea. Once we arrived, we were greeted by our hostess Geri (the first G in GGS) who encouraged us to select hats and gloves before we sat down for tea. This intimate tea room is by reservation only. Our family was seated around the dining room table that was laden with assorted tea time necessities. Fresh flowers, pretty tea cups, cream and sugar bowls, homemade jams and jellies, and personalized name tags, lace doilies, obviously every detail mattered. Geri serves decaffeinated Buckingham Palace Garden Party Tea which is a flavored black tea with delicate hints of lemon, ginger, jasmine and floral notes traditionally served at the Queen's garden parties. Once our tea cups were filled, the first course, a rich vegetable soup was served. A variety of scones and jelly was served next. Geri would bring each course to the table, and we would pass it around, making our selections. The jellies and cream included homemade lemon curd and homemade spiced peach jam made by Whimsey Doodles. As an interlude, we enjoyed a lovely peach applesauce that tasted just like summer! A tiered tray laden with buttery croissants filled with chicken salad (or plain for Cedar) was the next course served. And desserts, also served on a tiered tray included yummy miniature cupcakes decorated to look like flowers, a sweet little decorated hat shaped cookie to match the hat Geri was wearing, and a chocolate chip cookie. What a fun tea. Since it was just our family, we felt extra special. Thank you, Geri! This was a great way to begin our vacation travels. We're linking to Bernideen's Tea Time blog in celebration of National Afternoon Tea Week. 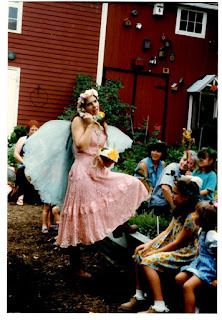 Fairy Festival Anticipation! and a look back! The 24th annual Fairy Festival is just around the corner! Scheduled to be held on Saturday, September 9th and Sunday, September 10th, advance preparations are in full swing for another special event! 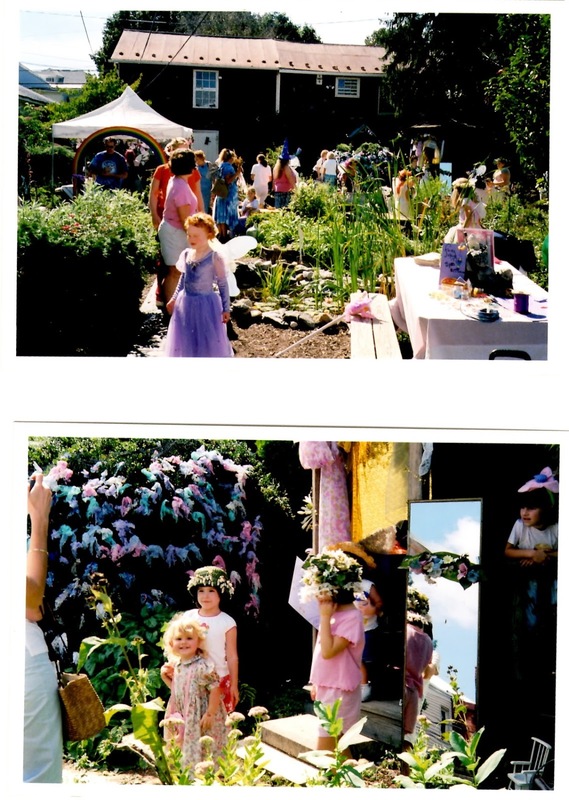 Here's a look back at the fairy festival over the years. 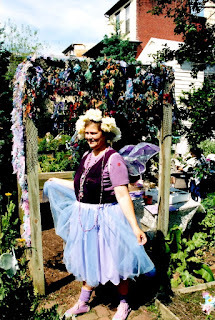 Fairy Rose Fairy has been a part of our Fairy festival for over 20 years! She delights young and old with her sweet songs and intimate tea parties. Parades of children follow behind as they discover different herbs in the garden and peek under leaves to perhaps find a hidden fairy. 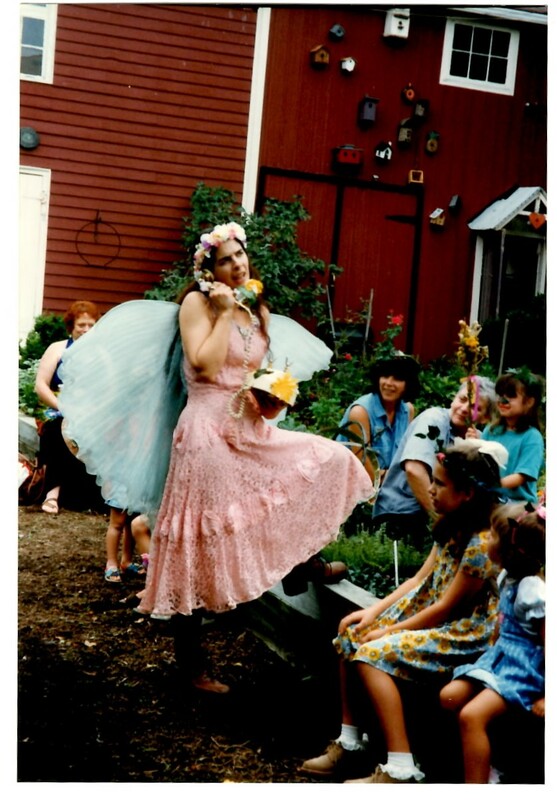 Posie Fairy joined in on the fun for many years, and while she isn't a performer any more she is still an active part of The Rosemary House Fairy Festival. You will find her at the festival alongside Kit Kat Sparkles as face painters. 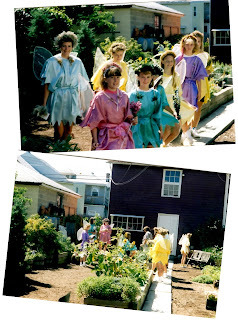 In the early years a group of Girl Scouts performed as the Fairies. 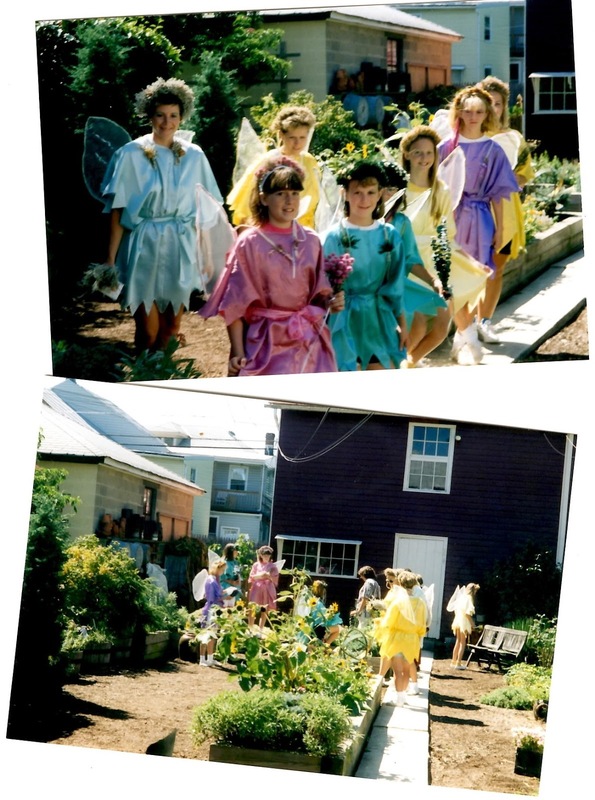 Sweet Pea Fairy (in pink) had a direct Hot Line to the Fairies. 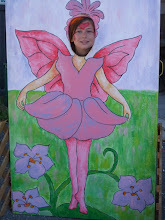 Susanna in her fairy finery. Be sure to check out the website to see what special activities are scheduled for Saturday and Sunday. There will be pony rides and even Cinderella carriage rides. 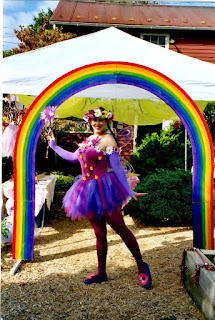 Music and entertainment, puppets and balloon twisters, fairies, food and fun! See you in September! Rosemary House Fairy Festival - special events scheduled for Saturday and Sunday, along with a list of vendors, are listed on the website. Susanna and I headed south to the Gettysburg area recently to attend a Royal Tea Club event. It was a combination afternoon tea and craft scheduled at Hollabaugh Bros. Fruit Farm and Market in Biglersville, PA. The event was held in their all-purpose room where colorful yellow tablecloths and beautiful bouquets of fresh field flowers set the scene for a bright and cheerful gathering. A fresh peach harvested from the surrounding fields graced our plate. Pots of hot water were on the table and a variety of Harney & Sons tea bags were offered . The pretty pink menus listed the several courses we would enjoy. A bowl of Fresh Spiced Peaches was the first course. Perfect for an August afternoon tea! The second course featured petite Herb Cream Cheese Appetizer Cups. A savory dollop of herbed cream cheese was topped with small piece of cucumber and radish and garnished with a generous piece of fresh dill all nicely tucked in mini phyllo cups. Very crunchy, very tasty, very fresh, and very pretty. Tiered trays laden with Ham and Cheese Sandwiches on Multigrain bread and Egg Salad Sandwiches on Pumpernickel held the next tasty course. The sandwiches were generous in portion and quantity. A beautiful pedestal plate held the Freshly Baked Scones. They were served with a selection of marmalades and jams that included Peach Jam, Ginger & Orange Marmalade, or Peach Jalapeno Jam. The scones were large, so a sampling of each jam and marmalade was easily accomplished! Several Ladies Teas are hosted throughout the year at Hollabaough Bros. Fruit Farm. They have an Autumn scheduled for Saturday, September 16th, 2017 and a Winter tea scheduled for Saturday, December 9th. Both teas are served at 1:00 and are for ages 13 and up.